Uglyworld #264 - Jeero's Sweatband, originally uploaded by www.bazpics.com. 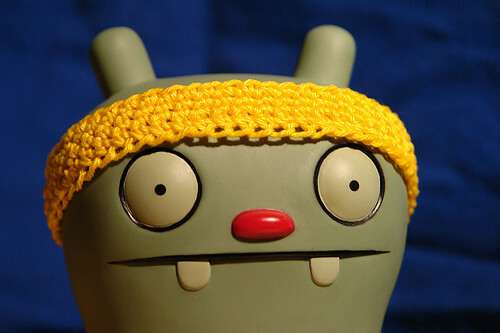 Jeero is the first in our household to start their 2010 fitness kick after all the eating which has taken place over the festive period. We had been in the process of making him a new hat, but he managed to get up out of bed before us and grab what had been made so far and jogged out the front door with it on (as there's about 6 rows made so far and he reckoned it made a perfect sweatband). I just hope he doesn't make it too sweaty otherwise it'll need to be washed before we can continue turning it into a hat.